The Galapagos Islands could be called “shark central.” More than 40 species of sharks—including hammerheads, whale sharks and whitetip reef sharks—patrol the rich waters surrounding the famous islands. 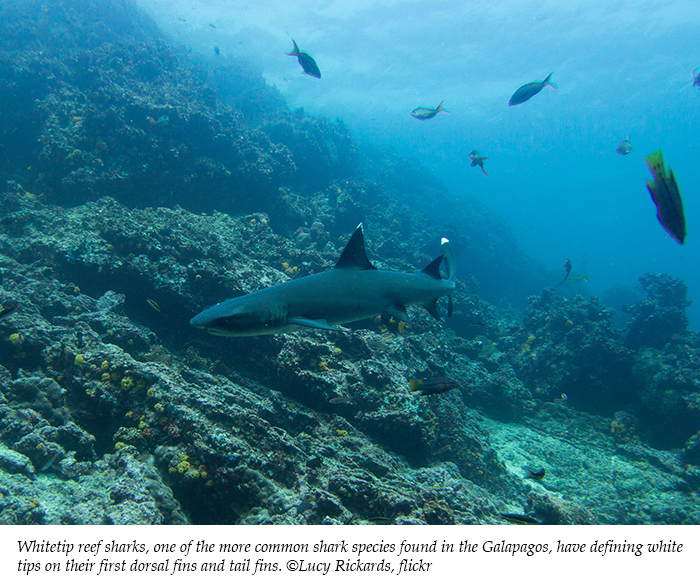 Sharks play an essential role in the Galapagos ecosystem. Much like the wolves in Yellowstone National Park, sharks here are apex predators that regulate populations of everything from fish to sea lions. They also provide regular income for local dive operators, and they attract tourists who come to the islands to experience pristine underwater environments. However, 90 percent of the shark species in the Galapagos are on the International Union for Conservation of Nature’s (IUCN) Red List of threatened species. That makes the news in a recent Washington Post article, written by Adam Popescu, all the more alarming. Popescu reports that shark populations are being targeted by large and small fishing operations eager to sell the animals’ fins to the Asian market for shark fin soup, a prized delicacy. The number of sharks being killed is hard to estimate, because so many are caught illegally. But according to one study, states Popescu, about a half-million sharks were killed annually in Ecuadoran waters from 1979 to 2004. Read about the crisis here. Because as Daniel Pauly, a University of British Columbia marine biologist and fisheries professor, states in the article, if something isn’t done soon, these sharks will vanish, irreparably changing the Galapagos and the oceans beyond them forever.